Special Keg Liquors Barrel Pick. 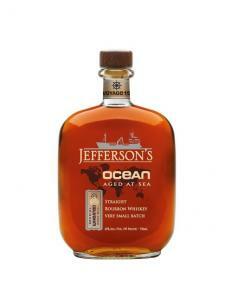 Jefferson's Ocean Voyage 15 plied the seas above and below the equator in relatively calm water and clear skies. Traffic moved on schedule through the Panama Canal in both directions and there were no significant delays at any of the ports on the five continents visited. What really made Ocean Voyage 15 unique was that it was our first "Wheated" voyage. The bourbon barreled for this voyage uses wheat as its small grain instead of the typical rye. Wheat is less flavorful than rye so during the maturation process it allows more of the corn's sweetness and the wood's vanilla to come through prior to being loaded onto our ships. Both salty air and heat transformed this bourbon. Salt is the dominant note that pops, and is more evident than all the other rye voyages. In addition, there is a viscosity of this bourbon after the initial sip. Up-front a salted CrÃƒÂ¨me BrÃƒÂ»lÃƒÂ©e with vanilla gives way to tobacco and oak mid palate, the wood staves provide a lingering brininess that stays with you throughout the finish. Notes found in all previous Ocean Voyages are amplified in Ocean Voyage 15 - Wheated as the salt, Carmel, and wood do not have the spice of the rye to compete with.